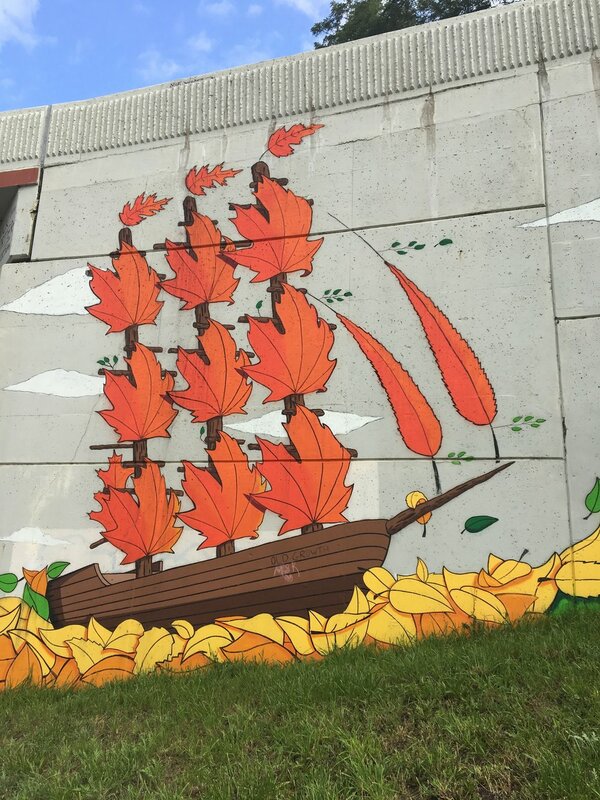 Sailing on the Winds of Change, 2015, exterior paint. N. Division. 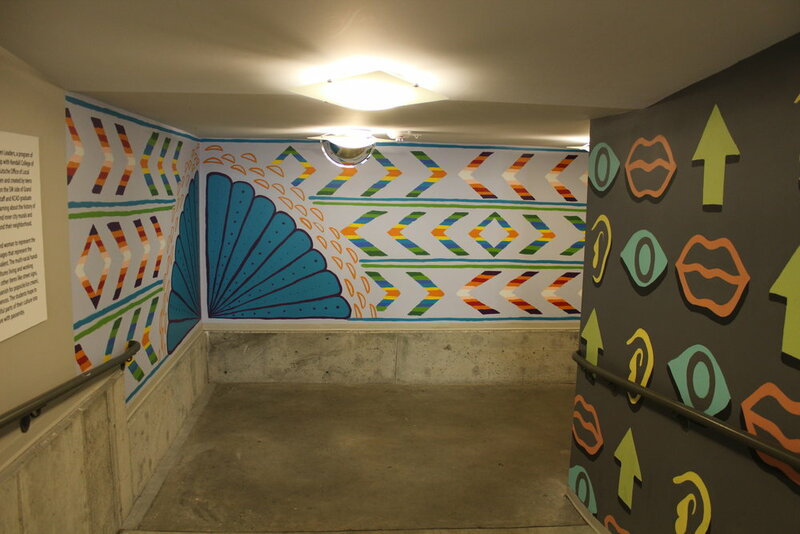 As part of UICA's Exit Space Project, Nick Nortier installed Sailing on the Winds of Change on the retaining wall of I-196 on N. Division in August of 2015. Nortier is the creative force behind Old Growth Creative. 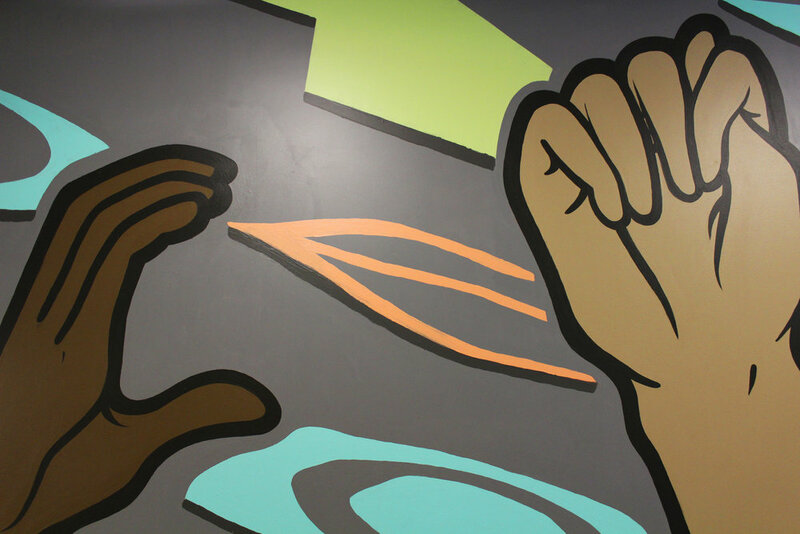 His focus is on murals, but he also illustrates and paints smaller scale panels and canvas, prints t-shirts, and cuts and installs vinyl decals. He has worked with clients such as Pabst Blue Ribbon, Downtown Grand Rapids Inc., Experience GR, Mulligan's Pub, The Mitten Brewing Company, Avenue for the Arts, and the Grand Rapids symphony (MySymphony360). 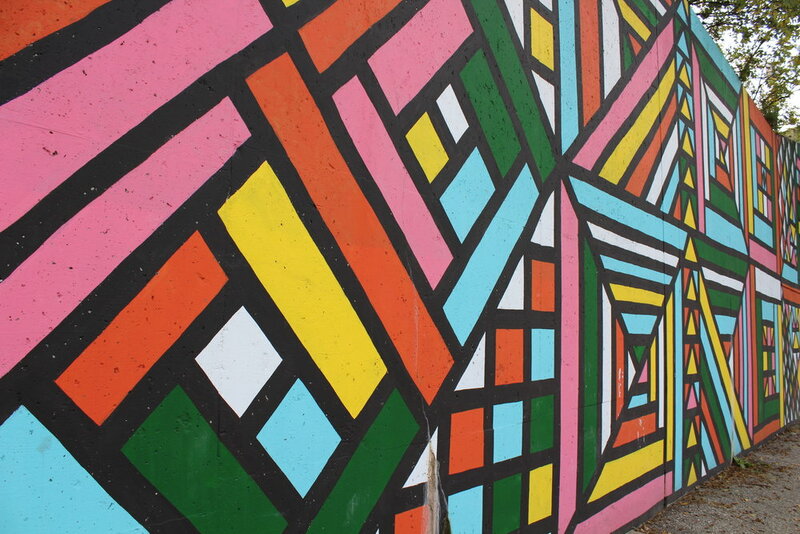 Supporters: Downtown Grand Rapids, Inc.
Out of the Blue, 2016, exterior paint. 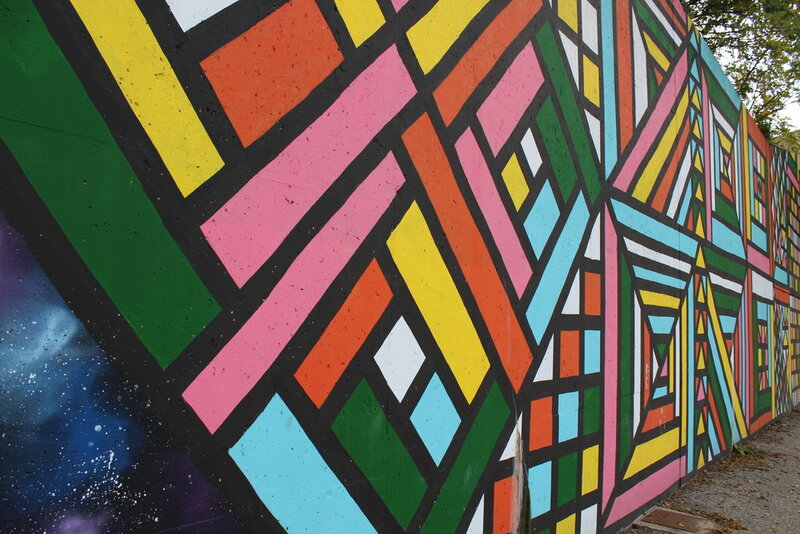 Straight St. and Fulton Ave.
ArtWorks is a five-week, free program for students ages 14-18 years old. Students participating in the program receive on-site job training and mentorship, and engage in art, design, and installation projects. Led by highly qualified instructors and artists, students work in small groups on creative projects and design solutions to meet client or community partner needs. 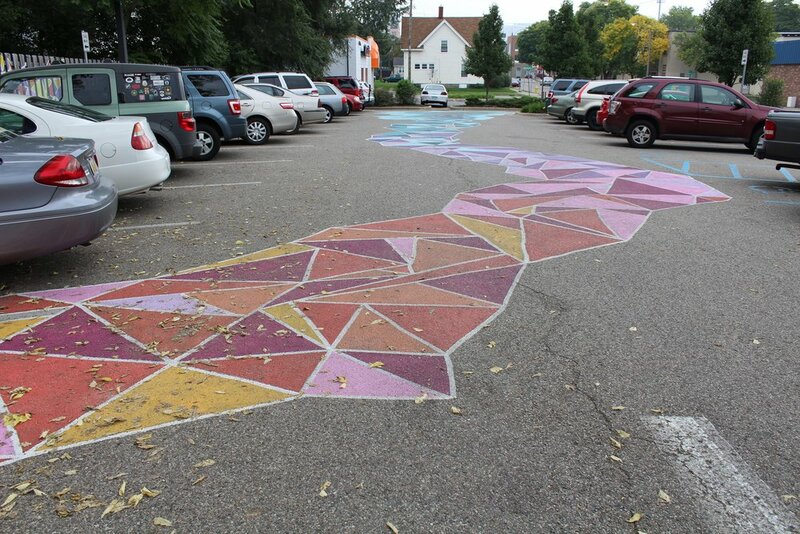 ArtWorks students installed Out of the Blue at the Grand Rapids W. Fulton Parking Lot as part of UICA's Exit Space Project in 2016. 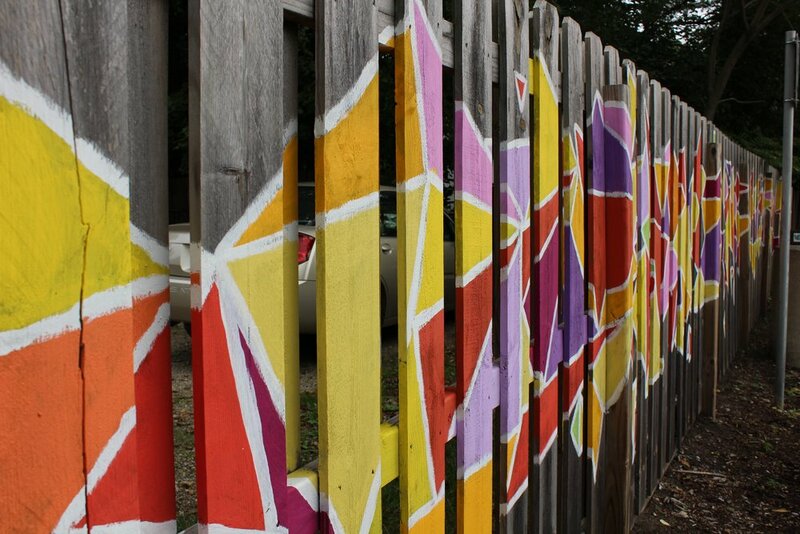 Grand Rapids Quilt, 2015, exterior paint. 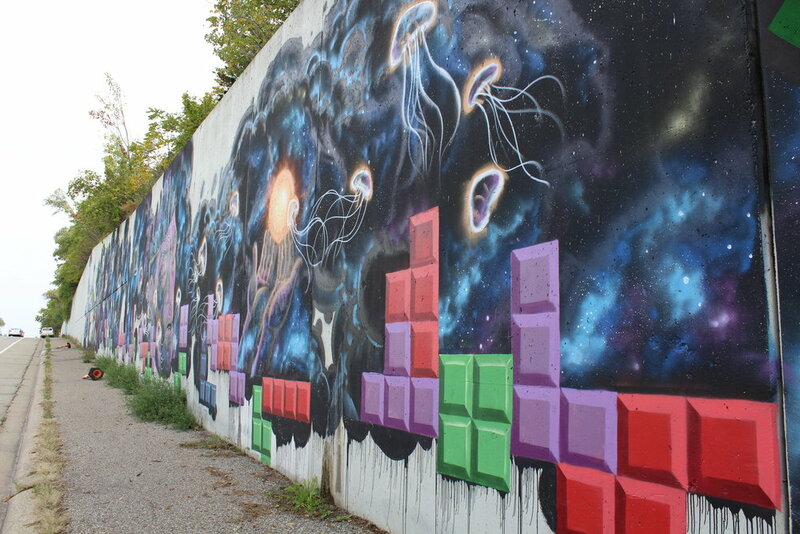 N. Division St.
As part of UICA's Exit Space Project, Eliza Fernand installed Grand Rapids Quilt on the retaining wall of I-196 along North Division in August 2015. Eliza has received a BFA in sculpture from the Pacific Northwest college of Art in Portland, Oregon. Her sculpture, installation, and performance works revolve around the combination of sensual and familiar materials, the intersection between bodies and objects in space, and the transformation of materials and ideas. She is inspired by craft supplies, relationships, forces of nature, small histories, bodily functions, mysteries, and scraps of things. Eliza has exhibited in and curated shows on both coasts and in between. She has also lived and worked at artists residencies in New Jersey, Normandy, California, North Carolina, New Mexico, Quebec, Idaho, Washington, and Minnesota. Quilt Projects is her ongoing investigation of quilt making traditions and techniques from he standpoint of a contemporary practice. 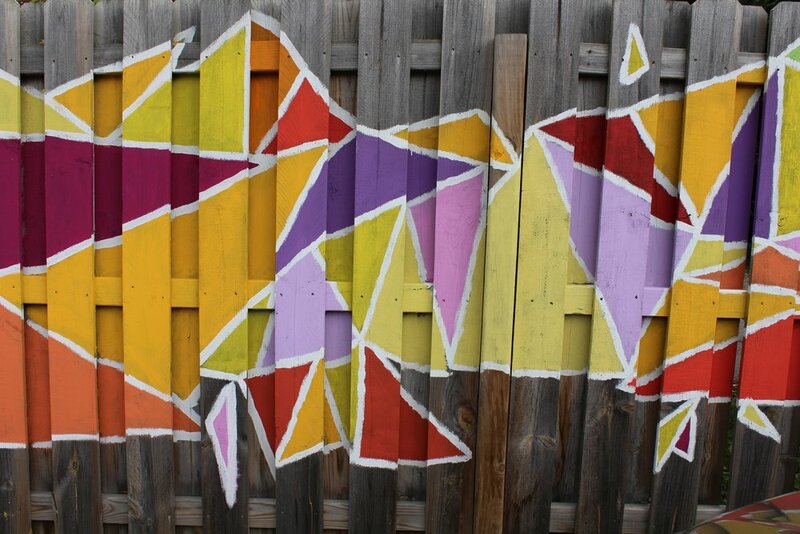 Untitled, 2015, exterior paint. North Division St.
As part of UICA's Exit Space Project, George Eberhardt installed Untitled on the retaining wall north of the I-196 underpass located on North Division. 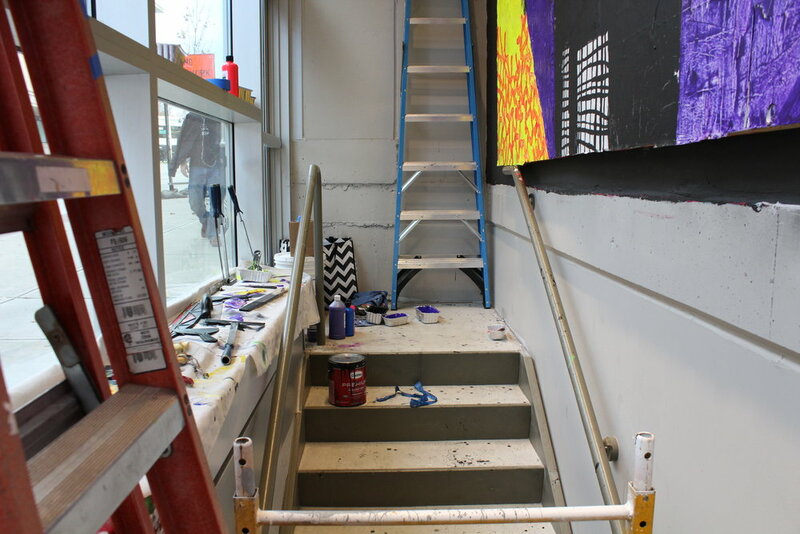 After a year at College for Creative Studies in Detroit, Eberhardt found himself looking for more and transferred to Kendall College of Art and Design. 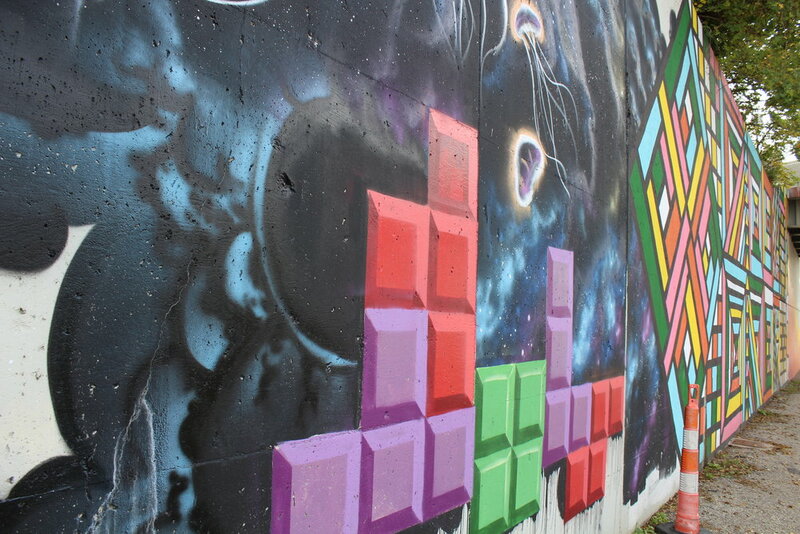 In 2009, he co-founded the GR8, an eight member art collective. 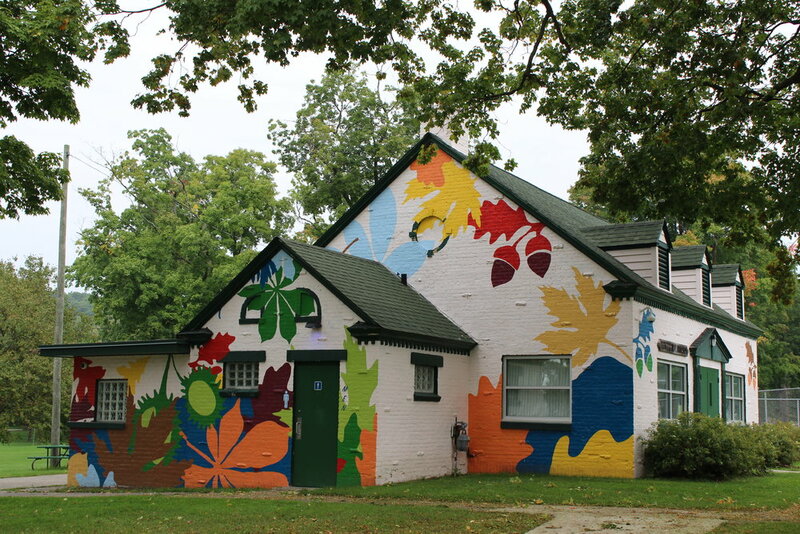 For the past seven years has helped to cultivate fine arts with youth in the community at West Michigan Center for Arts & Technologies (WMCAT) and the Granville Avenue Arts & Humanities Cook Arts Center. 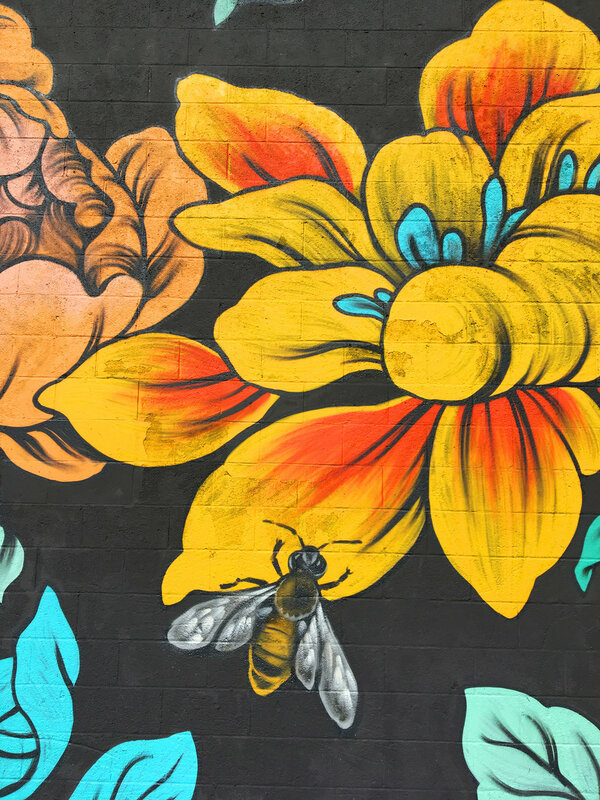 He is also a freelance artist who does everything from Live Art at the Pyramid Scheme, record covers, logo designs, t-shirt designs, paintings, murals, and more. 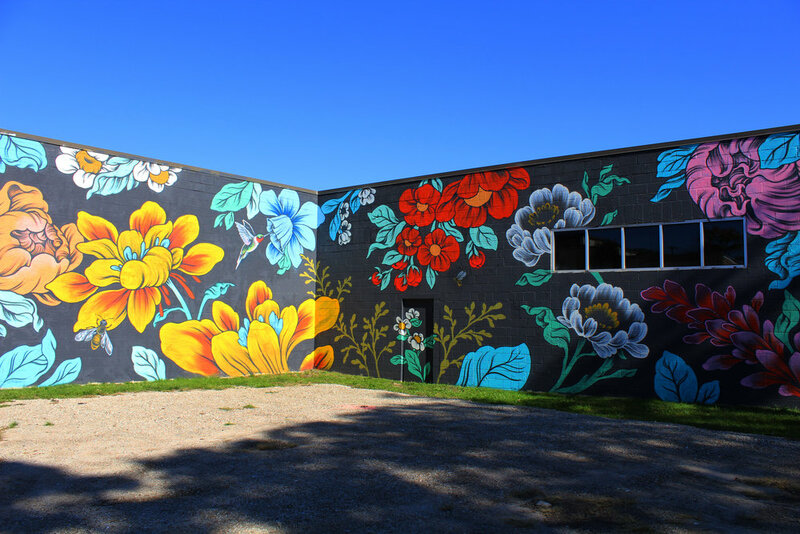 Louise "Ouizi" Chen installed Untitled, a sprawling floral mural, on the Grand Rapids Ballet as part of the UICA's Exit Space Project. 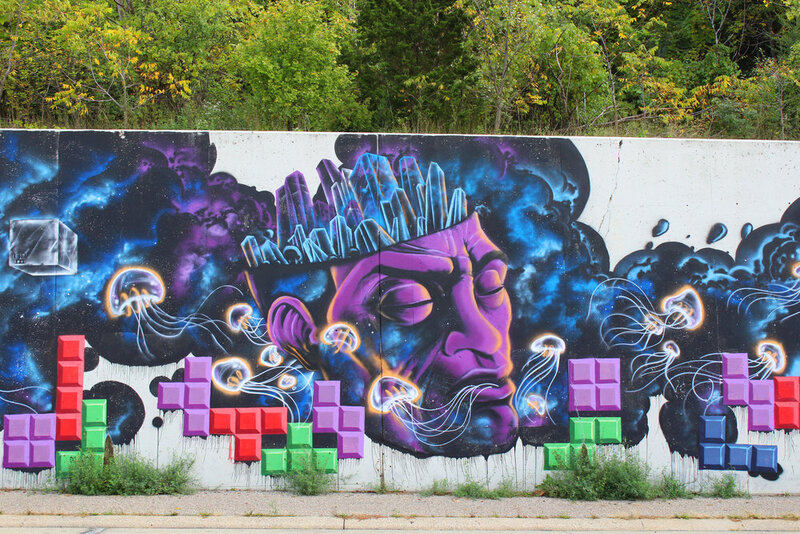 In the fall of 2016, this mural was included as one of the UICA's entries in Grand Rapids' Artprize 8. 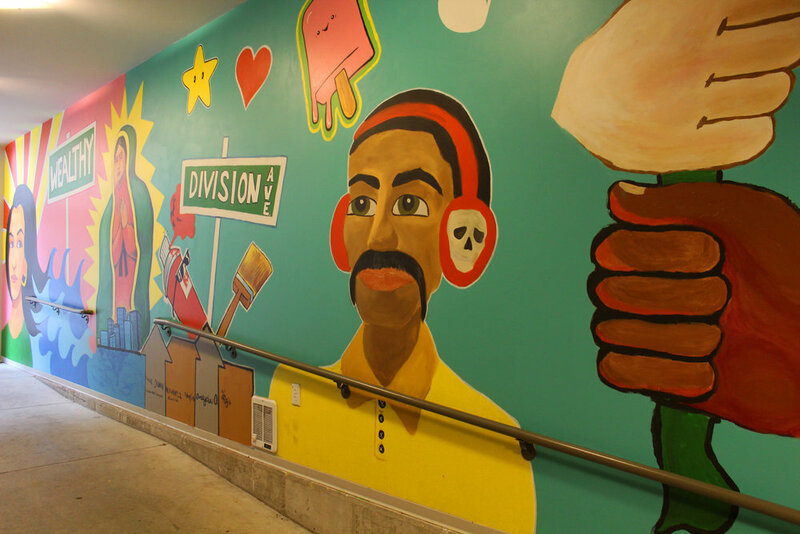 A mural artist based out of Detroit, Michigan, Ouizi has transformed walls and spaces in Brooklyn, Los Angeles, Iowa, Michigan, and Shanghai, among others around the world. 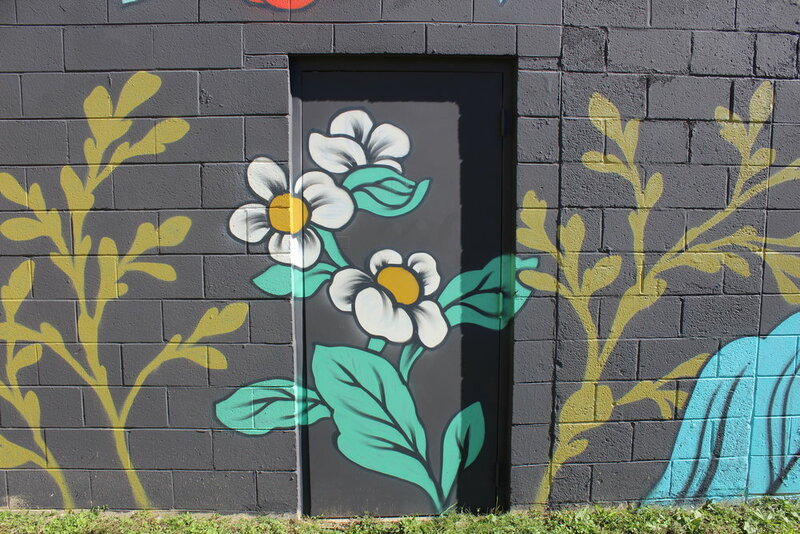 She continues to explore a connection to the natural world in large scale murals and print based media. 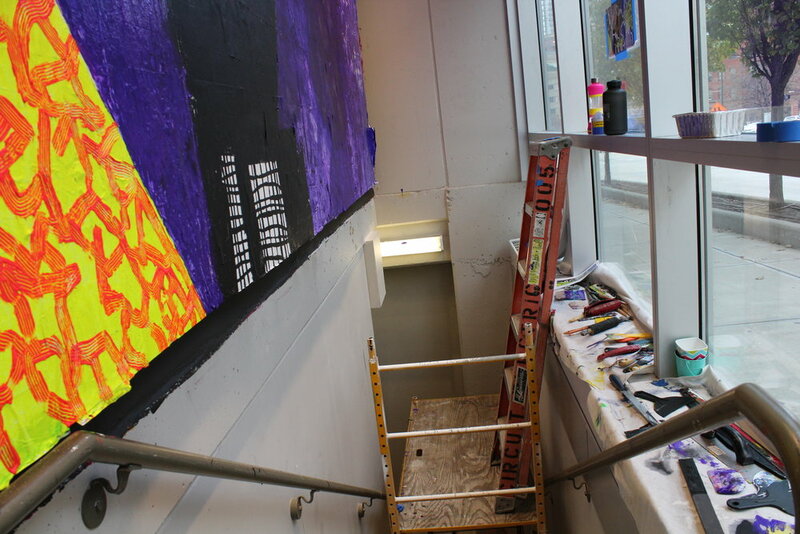 ArtWorks students from the UICA worked with Artists Creating Together on installing Untitled in the 8 Commerce Pedestrian Ramp for the UICA's Exit Space Project in July and August of 2015. ACT empowers individuals with disabilities to learn, grow, and celebrate through the arts. 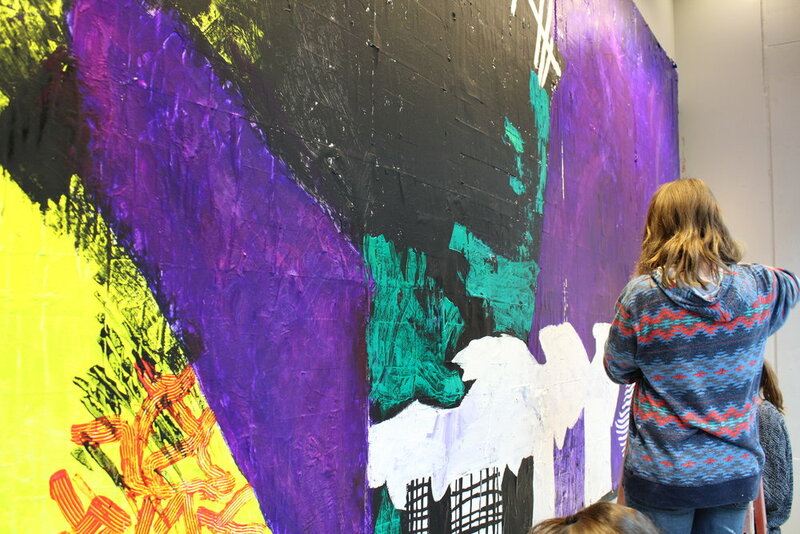 ArtWorks is a five-week, free program for students ages 14 to 18 years old. 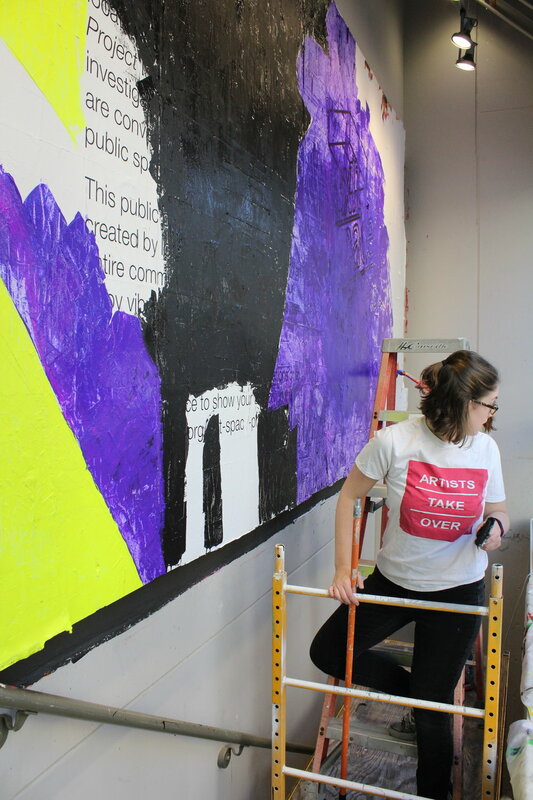 Students participating in the program receive on-site job training and mentorship, and engage in art, design, and installation projects. 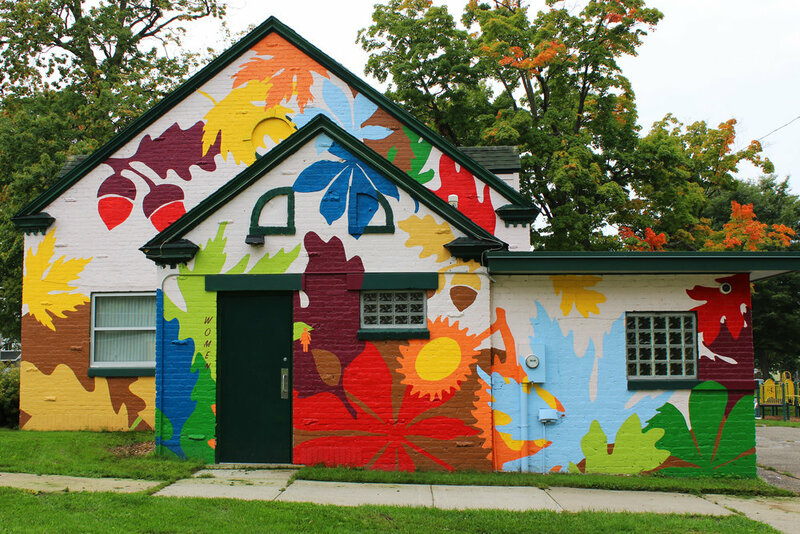 ACT provides artistic and creative expression programs that enrich the lives of people with and without disabilities in West Michigan. 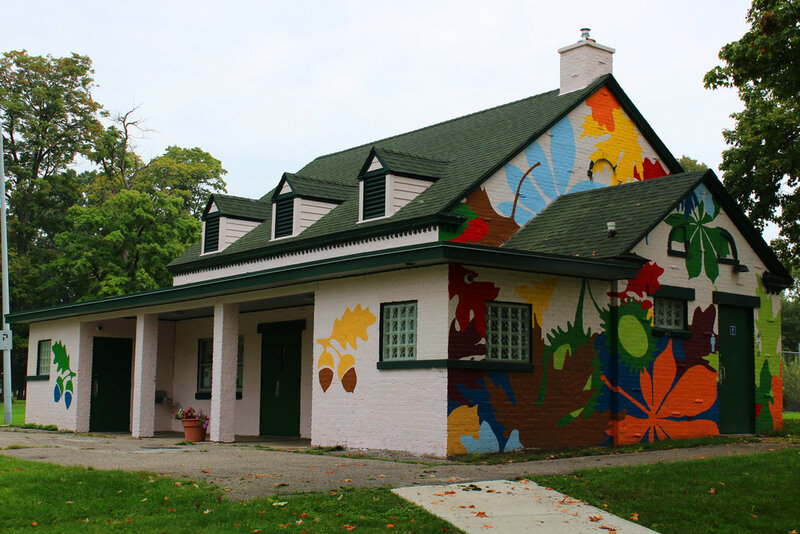 Kelly Allen installed Love for Our Trees is Love for Ourselves on Lincoln Park Lodge as part of the UICA's Exit Space Project in the fall of 2015. Through the unification of images, colors, and textures pulled from macro to microscopic realms, Allen's work initiates conversation and formulates new meanings. Kelly holds a Bachelor of Arts degree from Humbolt State University in Arcata, California, and a Master of Fine Arts degree from Kendall College of Art and Design of Ferris State University in Grand Rapids, Michigan. Allen's work has been exhibited internationally, including galleries and museums in New York, Los Angeles, San Francisco, Chicago, and London. The questions you want answered about Baggy By Design will likely go unanswered. Not so much because BBD refuses to answer them, more because it resists definition. To define it would be to confine it and you can’t confine a language. You can only enter it to understand it, listen to it to see how it observes the spectacle around us. 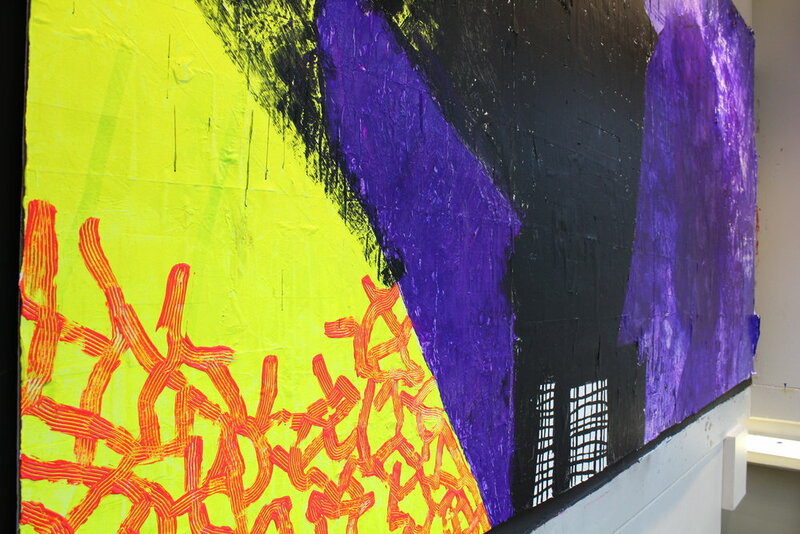 This installation is an investigation of language composed through color and shape. The power of language to persuade or deceive through coded characters acts as a tool of re-presentation. Recontextualized buzz word of this piece act as symbols of bureaucracy, bent on compensating for predestined fates.